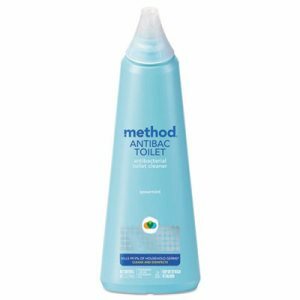 Ensure a thorough clean with a hardworking antibacterial cleanser that eliminates 99.9% of household germs. There's no need for harsh, foul-smelling chemicals--this product uses the power of citric acid to provide a sparkling clean. A pleasant spearmint scent ensures a lingering freshness after you clean. Ergonomically-shaped, attractive bottle belongs in every bathroom. Triclosan free and no animal testing. Biodegrades in less than 28 days. Application: Bowl Cleaner; Applicable Material: Porcelain; Dirt Types: Bacteria; Dirt; Germs; Soap Scum; Scent: Spearmint.